咁我公司新請返來果個Part Time GM 都係做呢d 野.我老細稱呼佢係 Internal Auditor....佢雖然有 A/C 底.只係讀過 很普通的IT Audit..佢冇專業的資格.會計師牌係冇..係靠佢有管理公經驗 同埋我公司並唔係大公司.得十幾人........管理階層即是係老闆...係對 cert 唔係咁 care. 在網上找到你個blog, 發覺有好多IA的資料, 我自己做了四年EXTERNAL AUDIT, 最近公司要CUT人, 所以想看看IA, 不過IA的需求好似好少,看來都不容易入行! 有一間listed co. 通過 headhunter找上了我,想叫我去他們的公司擔任internal auditor,他給的價錢並不會比我現在高很多,只是他說以後會加..
如果轉行去 internal auditor 會影響嗎?或者internal audit 還有別的出路嗎? 馬來西亞的情況我下清楚,但我有一位舊同事是馬來西亞人,住在檳城,現在仍時從事internal auditing 的工作,發展不錯。關於你的情況,其實不妨轉過來個IA,之後發覺不喜歡,轉回accounting也不會太難。走IA這條career path,目標自然時Audit Director(or Head of IA),如果表現好受公司賞識,轉去做其他management post,例如Group FC或者Finance Director等等也是時常見到的. 是像你說的access internal control 然後做個report 給management 看要怎樣進步嗎?? 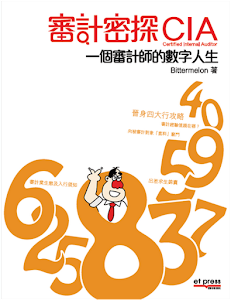 初入行的困惑, audit firm’s IA 還是 commercial IA?